With its sheer cliffs and striking black colors, some might argue that Black Canyon of the Gunnison National Park may be even more impressive than the Grand Canyon. Do you agree? Discover for yourself with our top 10 list. Black Canyon is named for its sheer black cliffs that plummet 2,000 feet to the river below. Get a peek into the canyon’s depths at one of the South Rim’s 12 overlooks on the Rim Drive. Our favorites? Chasm View, Painted Wall, Pulpit Rock and Sunset View. Drive down into the canyon via the East Portal. This 160-percent-grade road is paved the whole way but is very steep and includes many switchbacks. Leave your RVs at the top and take your personal vehicle down into the canyon. Before you go, grab a brochure on the history of the East Portal from the visitor center to learn about the amazing engineering feat that turned Montrose into fertile farmland. The Gunnison River inside of the Black Canyon is designated as Gold Medal Waters (waters that provide outstanding angling opportunities for large trout). Grab a fishing license in Montrose and try your hand from East Portal. Blue Mesa Reservoir nearby also provides a great lake trout fishing experience, in addition to boat rentals. For a truly unique camping experience, check out the East Portal campground. Situated right next to the river, you have the opportunity to fish Gold Medal Waters, hike or just enjoy the views. Looking for a more intense adventure? Hike to the river from the canyon rim. This experience is not for the faint of heart. There are no clearly marked trails, the journey is steep and often quite a scramble and frequent hazards include poison ivy, ticks and stinging nettle. Still interested? Acquire a same-day backcountry permit at the visitor center and start early with plenty of water, as temperatures can be extreme in the summer. The Gunnison Route is recommended for first timers and generally takes two or more hours to hike down and three or more hours to hike back up. Backcountry camping is available once you reach the canyon floor. Curecanti National Recreation Center, Black Canyon’s sister national park site, offers ranger-led boat tours into the canyon every day but Tuesdays throughout the summer. This 1.5-hour tour will allow you to experience the magic of the inner canyon while learning about the geology, wildlife, history and water of the area. Reservations are required and it’s strongly encouraged to make them several weeks in advance. Call (970) 641-2337 x205 to reserve your seat. Black Canyon of the Gunnison is an International Dark Sky Park meaning it’s the perfect destination for stargazing. The park offers many opportunities for night-sky viewing and constellation tours, including some with telescopes. Check the visitor center for the most up-to-date schedule. Want to try your hand at night sky photography? Take our online course (www.nationalparktripsmedia.com) before you go to sharpen your skills. The North Rim of the Black Canyon of the Gunnison is much less developed than its southern counterpart. There is not a visitor center and the ranger station is intermittently staffed. However, this side of the canyon sees much less traffic and boasts even more incredible views than the South Rim. The cliffs seem sheerer, there are fewer people, beautiful trails -- what’s not to love? Allow yourself two hours from the South Rim Visitor Center and note that the last few miles of the road in are dirt. Head to the historic town of Cimarron, once a train depot and now a window into the past. Tour the visitor center and the rail yard exhibit to get a taste of what the Black Canyon was like in 1882. You can also view the last remaining truss bridge in the area. Attend a free ranger program from Memorial Day through September on topics ranging from geology to nature, night skies to history. Stop by the visitor center for the most up-to-date schedule. Thanks to the East Portal Tunnel, the Uncompahgre Valley is full of fertile farmland. Visit the town of Olathe, between the South and North Rim entrances in August each year for the Olathe Sweet Corn Festival (olathesweetcornfest.com) to celebrate the town’s famous crop. The festival falls on Aug. 4, 2018. Did you know Colorado’s 300-plus days of sunshine each year and cool nights make for ideal grape growing conditions? Sample Colorado wine on the Olathe Wine Trail (coloradowine.com), curated by Colorado Wine. You’ll drive from Delta to Olathe and sample wines at Mountain View Winery, Cottonwood Cellars/The Olathe Winery and Garrett Estates Cellars. Wondering where to head next? Mesa Verde National Park is just four hours from Black Canyon of the Gunnison. There's more to do beyond the main attraction of touring ancient cliff ruins. Take a hike, gaze from a fire tower or have dinner with a view. 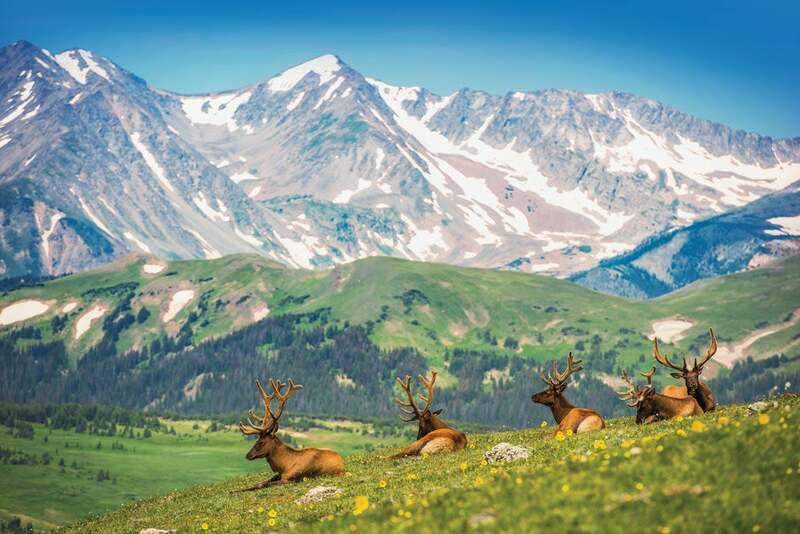 Rocky Mountain National Park and its two gateway towns offer a number of romantic ways to spend time together.